Don't let a little thing like rain keep you from your busy day. Hit the (wet) streets in superior style with these easy, waterproof slides from Aetrex. 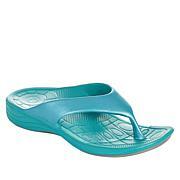 Soft, UltraSKY-injected foam provides extreme comfort and durability for women that are always on the go. The Lynco orthodic-designed footbed offers extra support, balnace and alignment, while a soft metatarsal cushion reduces foot stress. Once you step into a pair of Aetrex shoes, you'll never look at your old shoes the same way again. The fit is perfection. Super arch and metatarsal support . Solid construction. I will be back for another pair. I bought this brand in a watermelon-colored thong and decided to try the blue (teal) slide. It's great!! No worry of walking out of them. They are a nice supportive/snug yet stretchy fit that is ever so comfortable and squishy. A terrific fitting shoe that looks good too. Please add more of this style in more colors. IMO...everything we love about Crocs but SUPERIOR due to orthotic for comfort. I intend to buy more. I don't understand the negative reviews - this is the most comfortable slide I've ever had on my feet. I'm so sorry others had problems. I wear a 5 1/2 street shoe, and went up to the 6 as instructed in the presentation. The fit is great. They are easy to slide on, and I wear them around the house and outside in the garden. They just rinse off and dry in seconds. I don't like a thong style, as they tend to hurt between my toes - these are pure perfection. 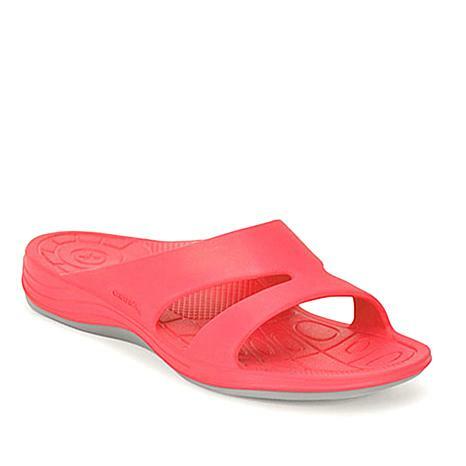 i have been looking for comfortable slides with good support that does not have the thong in the middle. Then I discovered this online. I love it!! . I have been wearing around the house since I received them. I purchased them to wear to the pool or a water park. The color I wanted was not available but I will keep watching for another color. I have told all my friends about them. They are not very attractive but perfect for comfort.That is exactly what I needed. The price was comparable with other styles on the market. I'm glad I purchased this product.